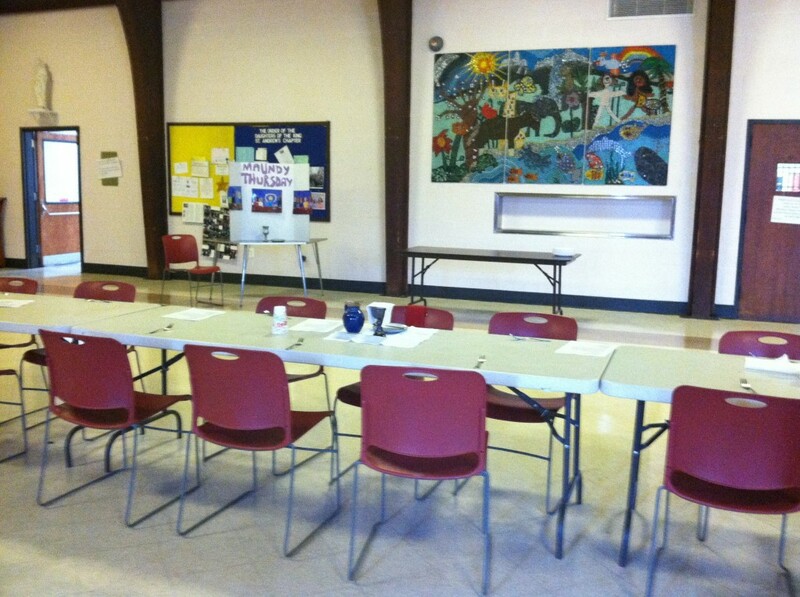 St. Andrew’s in College Park, Maryland has a traditional Maundy Thursday service and foot-washing, and for Holy Week 2013 a committee of parents and I developed a service open to the entire congregation, but especially suited to children. The early evening service has three stations: a long, common table for Eucharist and our shared meal; an area for drawing our footprints on a large cloth; and an area for foot-washing. We began our meal with the Eucharist, during which we told the story of the Last Supper according to the Gospel of John. For music, we sang “This is My Commandment that you love one another.” One parent baked challah bread, marking this as a special evening. After supper we moved to the footprint and foot-washing stations. We had a large cloth of heavy white cotton. 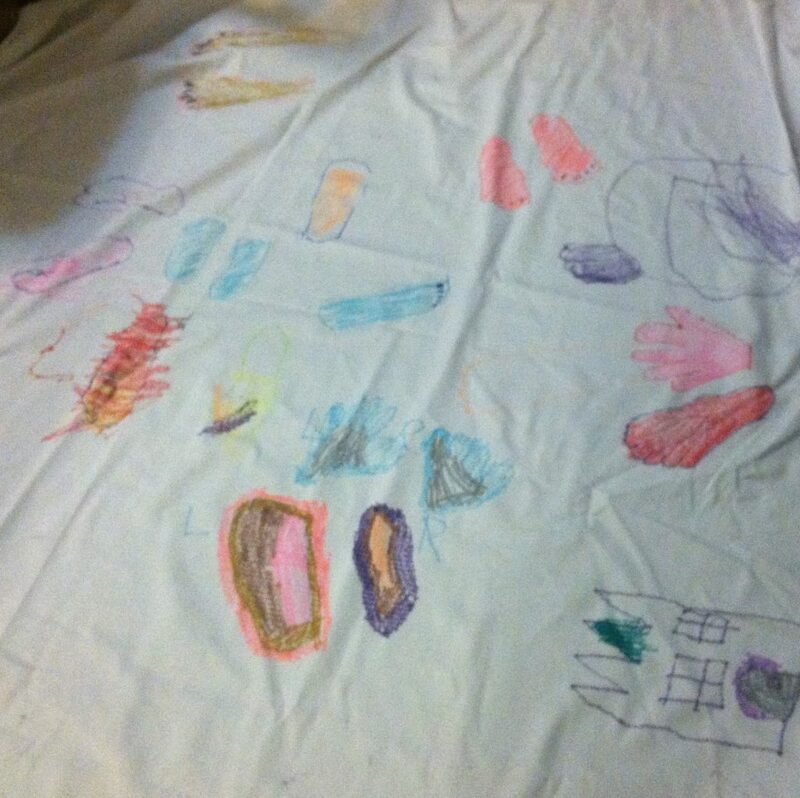 Children and adults used fabric markers to trace their feet and color in the footprints on the cloth. After tracing our feet, we moved to the foot-washing station. A wise parent suggested that we use damp washcloths placed in warming crockpots, thus preventing any major water spills from water pitchers. One of my favorite moments was when a young boy shouted out early on to his dressed-for-work mother, “I want to wash your feet, Mommy!” We taught the children to sing “Ubi Caritas,” which they continued to chant throughout the foot-washing. Jesus, You showed us how much you love us and taught us to love You, ourselves, and one another. We pray that all people may live together joyously, giving and receiving love. In your Holy Name, AMEN. We departed in (near) silence. Elizabeth Ewing is the Assistant Rector and Director of Children and Youth Ministry of St. Andrew’s Episcopal Church in College Park, Md. She holds a Master of Divinity degree from Virginia Theological Seminary. This article originally appeared in Episcopal Teacher, published by the Center for the Ministry of Teaching.